Today I'm bringing you a scrumptious and super-easy savoury bake inspired by a recipe from '150 Fast & Simple Recipes' by Parragon Books. 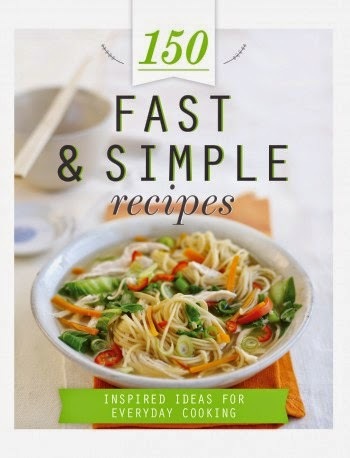 This gorgeous little hardback, full colour cookbook is full to bursting with super-easy recipes centred on speedy cooking - perfect for a busy family, or working couple who don't have much time to create in the kitchen. ...to name but a few! I'm a HUGE fan of Greek food and flavours, especially during Spring and Summer - my favourite family meal to cook is a slow cooked Lamb Kleftiko (Lamb shoulder, new potatoes, olives, feta, lemons, rosemary, tomatoes, oregano, shallots - all cooked in a big parchment paper bag for 4-6 hours!). 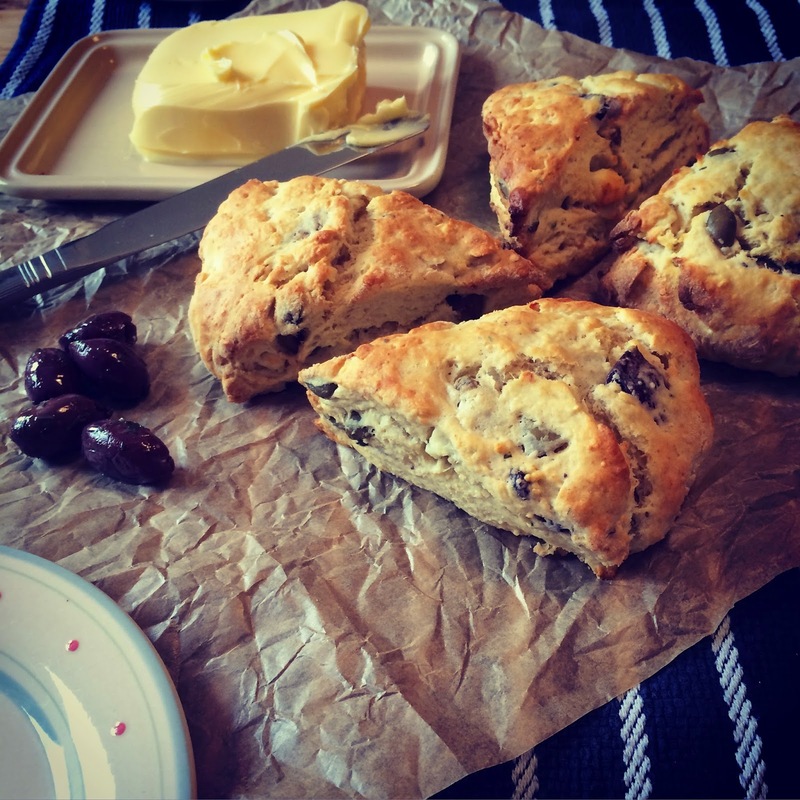 I usually serve it with a huge Greek Salad and homemade pitta breads - however, when I saw the recipe for these simple scones I instantly imagined baking them alongside my Kleftiko - yum! 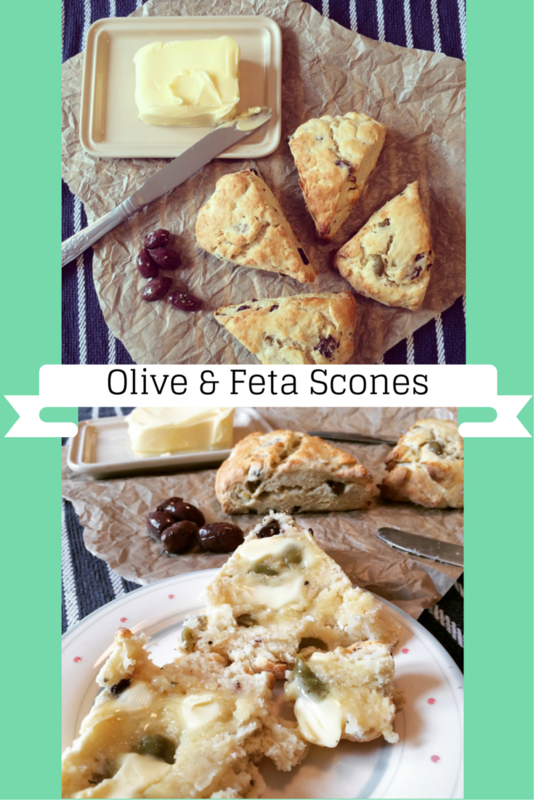 The recipe for the scone dough is bursting with fresh pitted olives and loads of crumbled feta cheese - they come together so quickly and bake in just 15 minutes! Perfect for an impressive but speedy bake! We ate ours warm from the oven for a weekend lunch - we smothered them in salty butter and they were simply divine!! We reheated the leftover scones on Sunday in the oven for 5 minutes, and enjoyed them the same way for our Sunday lunch - they tasted even better after a day so the flavours could develop even further. These will definitely become a regular bake in The Bishop household, even Bert devoured one! I have adapted the recipe from the book to accommodate my own tastes (I find it virtually impossible to stick exactly to a recipe: I have taken out 40g of sun-dried tomatoes and replaced with extra olives) and I've altered the method from the one in the book to make it a speedier rolling out/cutting process...alternatively you can roll out and use a traditional round scone cutter, if you prefer. 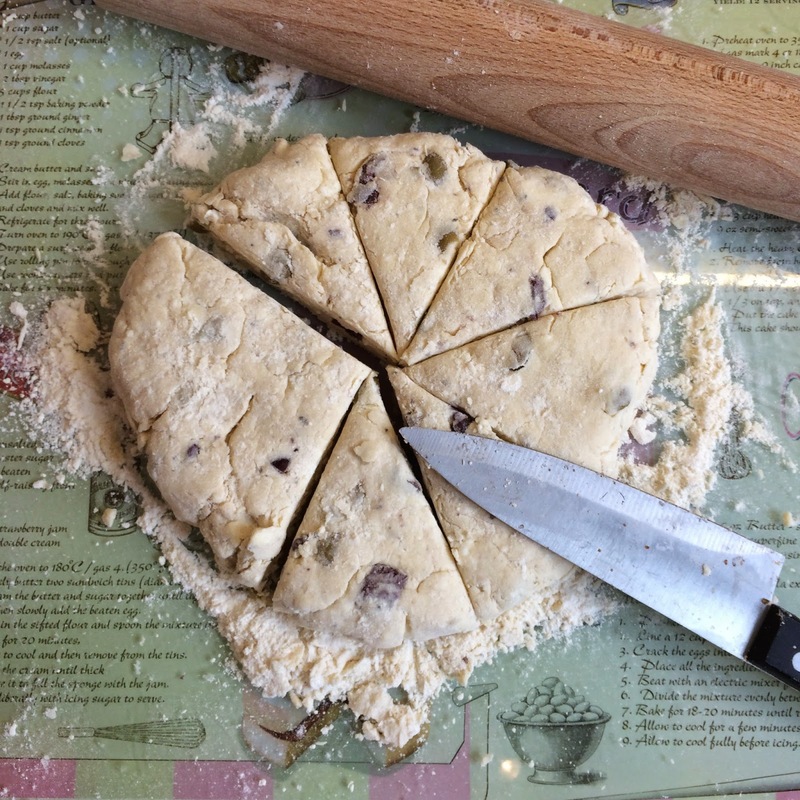 The dough makes 8 generous scones, and each one is 298 calories. 1. Pre heat oven to 220℃. Grease a baking sheet. 2. 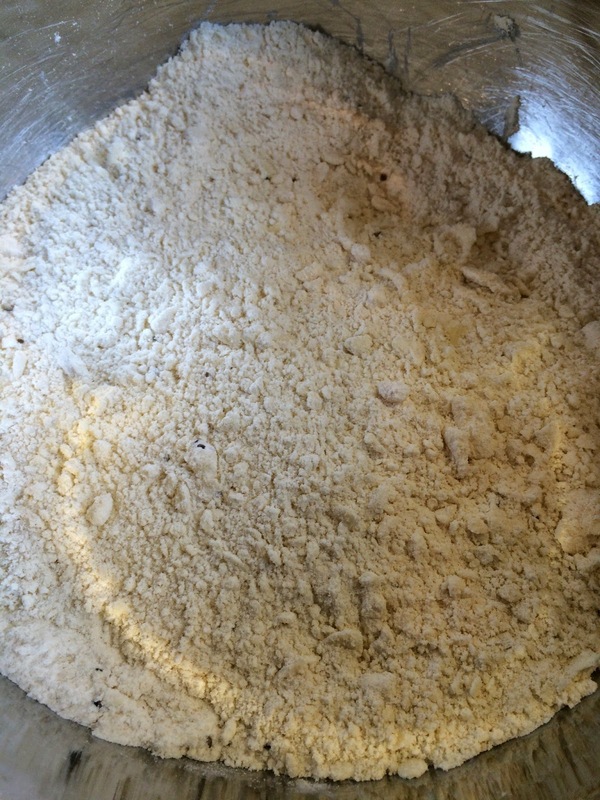 Sift flour and salt/pepper into a bowl and rub in the butter evenly with your fingertips until it looks like breadcrumbs. 3. 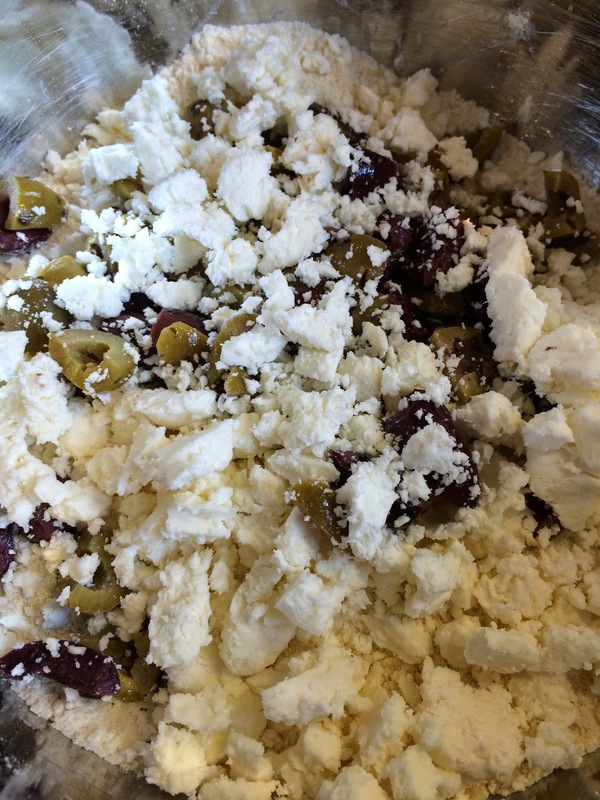 Stir in the olives and feta, then stir in the milk to make a smooth, soft dough. 4. Roll out on a floured surface into a large circle until it is about 3cm thick. 5. Divide the large circle into quarters, then into eights like you would a pizza (see below). 6. 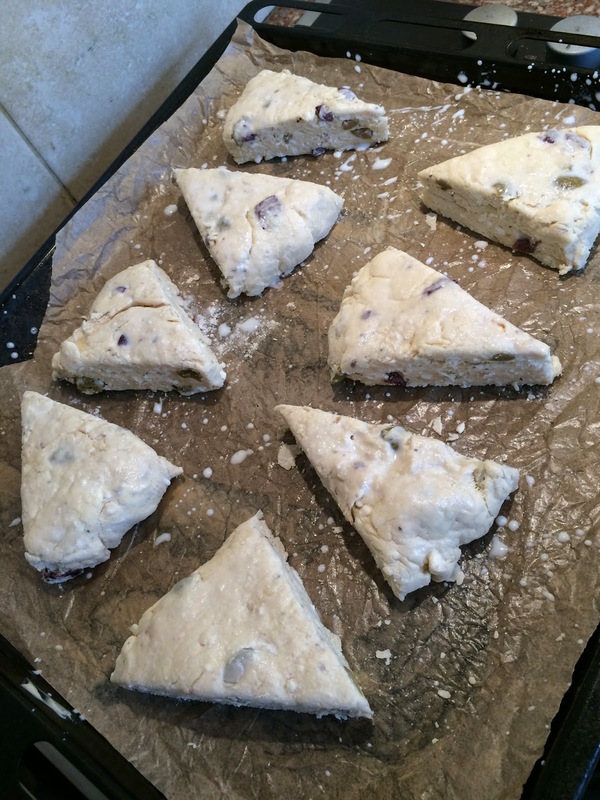 Place each triangle scone onto the pre-greased baking tray and brush the tops (not the sides) lightly with milk. 7. Bake for 15 minutes until golden brown and firm. 8. Leave to cool for a few minutes and then smother them in butter & stuff them in your gob! Ha! These scones were completely delicious - they melted in your mouth and were soft, buttery and so satisfying. This sort of simple and speedy bake really is a perfect place to start if you're a newbie in the kitchen and a little afraid of getting your bake on. Olive and Feta Scones, fresh from the oven! A marvellous weekend lunch, or dinner-time addition - these scones would also make any picnic perfect: a truly versatile make which will have your tastebuds doing a little dance! 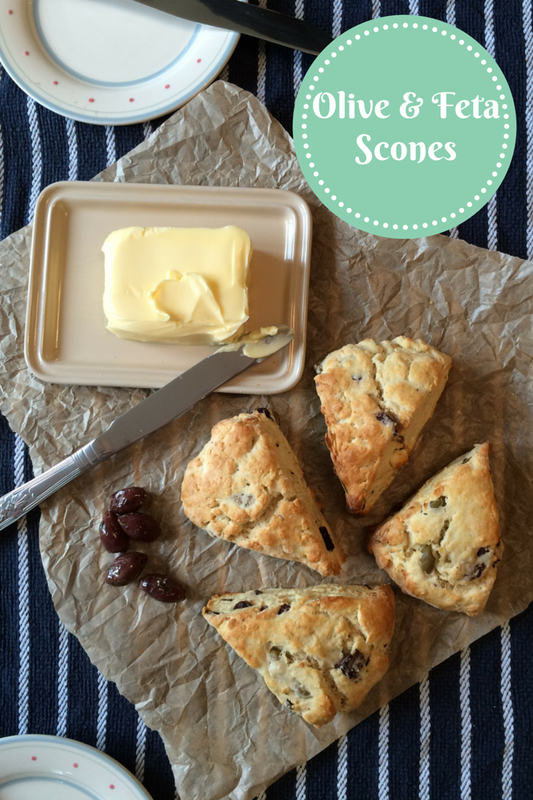 Don't miss out trying these super simple and ultra fast savoury scones!